The Transforming Neighborhood Network Centers for Job Creation and Broadband Access project plans to expand and enhance the services of five public computer centers located in public housing developments in San Bernardino County, California. Currently, the computer centers are open only to public housing residents and Section 8 recipients, have extremely limited hours, and receive slow Internet service. With this grant, the centers expect to add 25 new computer workstations (an increase of 50 percent), open to the general public, increase broadband speeds at each center, and extend operating hours to 60 hours per week. In addition, the project will provide three types of training for public housing residents, low income populations, children, and the general public: basic computer literacy workshops, 9-week long workforce skillbuilding courses, and in-depth online occupational training. Since receiving BTOP funds, the Housing Authority of San Bernardino, in partnership with the Career Institute National Federation Center, has enrolled more than 70 participants in a 12-week workforce training program. The curriculum offers training in writing cover letters and resumes, conducting online job searches, and applying for employment. Targeted to public housing residents at five public computer centers in San Bernardino County, Calif., participants can also earn an online National Retail certification. This certification, developed by the National Retail Federation, demonstrates that an individual is credentialed in customer service, sales, and retail management. 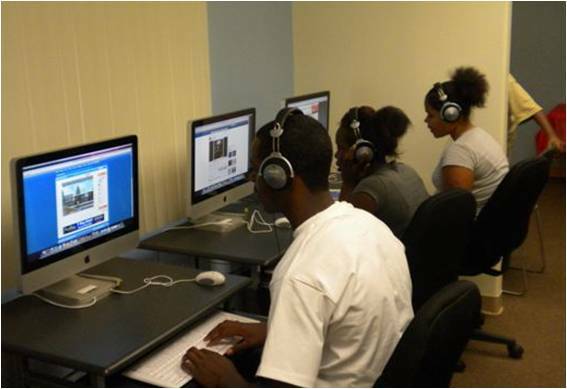 In fall 2010, the Housing Authority also hosted 15 job training classes and seven job search/resume workshops at its computer centers. BTOP funding has not only helped the Housing Authority hire nine new full-time staff, but has also helped 86 computer center users/trainees gain new jobs. The Housing Authority also extended hours in computer labs across various community centers in the San Bernardino City Unified school district. Operated by the Top Flight Education and Sports Organization, the computer labs are open Monday through Thursday afternoon to assist more than 30 children each month with homework and other school-related projects.